This is a fact lost on most golf marketing agencies. Instead, most print advertising is a giant waste of time, money and trees. The majority of graphic designers and ad agencies are FAR more interested in making ads look pretty or winning awards than making them actually sell! They design ads people “like” not ads that actually make the phone ring, boost your prospect database or increase your income! At Legendary Marketing we live and die by the acronym I-N-C-U-I-S. It’s not creative unless it sells! 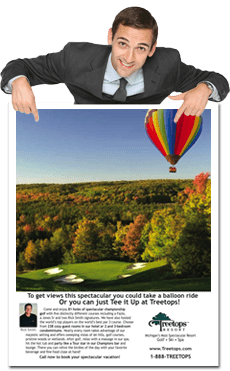 Effective Golf Advertising Starts With a Legendary Idea! The idea is turned into a captivating story about your product and summed up in a headline that grab’s the reader’s attention. That attention is heightened by flowing copy that weaves benefits with proof and cumulates in a strong call to action. From USA Today to regional and local publications, Legendary’s print work combines strong sales copy with the visual elements that attract attention and support your emotional message. Thus blending our legendary creativity with the science of great advertising and direct mail so your phone starts to ring! Maximize Revenue From Every Ad! Our creative yet systematic approach to ad, brochure and direct mail design allows us to squeeze every last cent possible from your budget. Then we will provide you with the tools to track and measure the response, so you know exactly how effective your ad really is! While other agencies talk about creating a presence, racking up impressions or winning design awards we find our partners are far more interested in increasing sales! Click here for more ads from our portfolio of ads, brochures and direct mail.